(Bloomberg) -- Chad Korth’s Nebraska farm was mostly unscathed from the catastrophic floods that soaked nearby fields thanks to being positioned atop a hill. But as the waters recede, he’s not expecting to be spared the financial blow that’s hitting the region. After bulging waters from the Elkhorn River took out bridges and roads, Korth -- a third-generation farmer who raises corn, soybeans and cattle with his father in Meadow Grove -- said he’ll have to chart out new courses to go buy equipment. 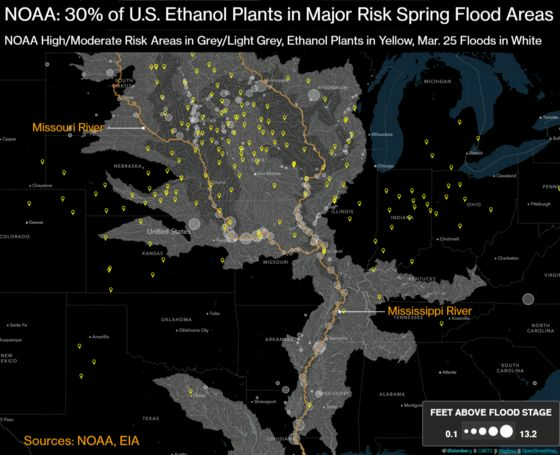 Meanwhile, local corn prices have declined because the flooding forced Valero Energy Corp. to idle its ethanol plant in Albion. Annual demand from the mill is usually about 47 million bushels of corn. The flooding forced ADM to halt output at its Columbus, Nebraska-based corn-processing plant because of washed out rail lines and roads. Valero said that because of the snarled transportation out of the Midwest, the Austin, Texas, market will begin sales of non-ethanol blended gasoline as of Monday. Flint Hills Resources LLC is also adjusting gasoline production to make up for the loss of ethanol. Cargill Inc. said that while all three of its Midwestern ethanol mills are operational, it’s also seeing rail challenges. Flooding severed Union Pacific Corp. east-west rail mainline, west of Columbus, with recovery set to take weeks, Chief Executive Officer Lance Fritz said in an interview Tuesday. Traders are paying the biggest premium for April gasoline over May in more than a decade as refinery upsets and the ethanol delivery interruptions reduce supplies for immediate delivery. On the Senate floor on Monday, Senator Chuck Grassley, an Iowa Republican, said that flooding has impacted roughly two-thirds of the state’s counties and that damages estimated for agriculture total $214 million, so far. The Environmental Protection Agency said the flooding has reached at least eight Superfund sites in three states, and kept EPA staff from determining whether any are leaking toxic chemicals as a result. The blow comes at a time when the agriculture economy is already deeply suffering. U.S. net farm income is projected to be $69.4 billion this year, or 44 percent below the record set in 2013. Growers have racked up debt amid a glut of crops as the trade war hurt demand.